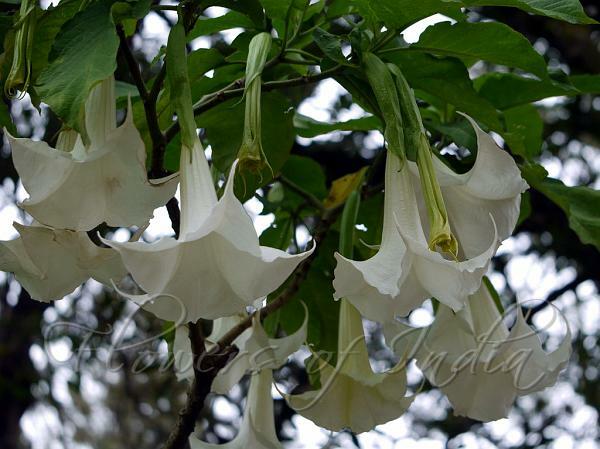 Tree Datura is very similar to Brugmansia suaveolens but attains heights up to 25 feet that produces long trumpet like flowers, hence the common name. This plant is common in cultivation and is very ornamental. Leaves are large, 8 inches long, elliptic and velvety. Flowers are fragrant at night. 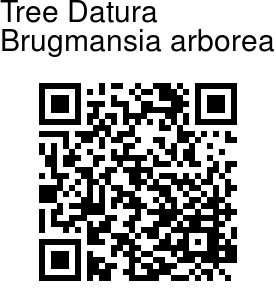 It has been used since the dawn of time by the aborignial people of the western Amazon area. The plant is considered a source of ritualistic medicines of great healing power. Its flowers are often eaten as phycotropic drug. The effect however is not a good 'high'. Instead, it causes nightmares and bad hallucinations.